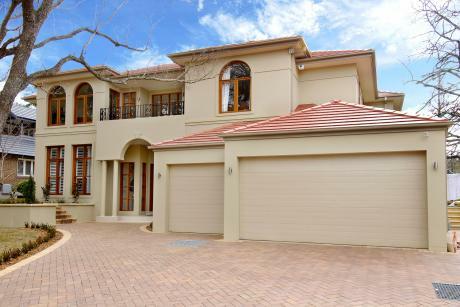 With the owner’s being artists, this residence in Warawee demanded a state of the art elegance and grandeur. From concept to completion, a modern residence with the elegance of a European villa and Tuscany was in mind, one which the client would fall in love with and happily call home. The client wanted an open layout plan incorporating privacy in each zone. The outdoor element was so vital, opening the home to nature, with indoor areas flowing effortlessly to outdoor entertaining spaces. This also reflects the European lifestyle the client was seeking. The kitchen was designed to be a focal point of the home, with the areas seamlessly integrating and branching out. Being an artist, the client’s demand for a studio was high priority on the list of requests. This was to be placed in the garden as an escape from the hustle and bustle of the house. The land was actually part of an historical estate and the new residence had to be in keeping with the surroundings. External finishes and colours were succesfully integrated with the historical context of the property.